I can't believe that it's November already and time for another In My Kitchen post! This year is just flying by at our house! Because a number of family members have birthdays during October and November I have the perfect excuse to whip up a celebratory cake or two! This one - from the archive that is my 'Brown Book' (and the repository of my favourite recipes across the wonderful years of my marriage) I hadn't made for years. It's named Gateau Belle Helene - and after all these years I don't know where I originally found the recipe. I decided to give it a modern twist by poaching the pears in a syrup flavoured with honey, star anise and black peppercorns. It got a thumbs up all round! I enjoy tea and find this one, 'Just Lavender' from T2, to be delicate and calming. It's a perfect drink to have before bedtime. I have read a number of IMK posts featuring Heilala vanilla and was thrilled to find that my favourite greengrocers shop 'Metropolitan Fresh Fruiters' at 'The Avenues' Shopping Centre, St Peters is now stocking it. I can't wait to put those pods to use - the perfume alone is heavenly! In my kitchen this month I put the Nelshaby Capers featured in last month's post to good use. Together with a bay leaf, fresh thyme and basil from the garden they added superb flavour to this chick pea braise. I tidied my utensil drawer recently - and to my amazement filled this stone jar with wooden spoons, spatulas and balloon whisks! No wonder the drawer was overflowing! With the warmer weather upon us it is a pleasure to again cook outdoors in the garden. I do love a good chargrilled vegetable or two! Finally, my kitchen disaster for the month! 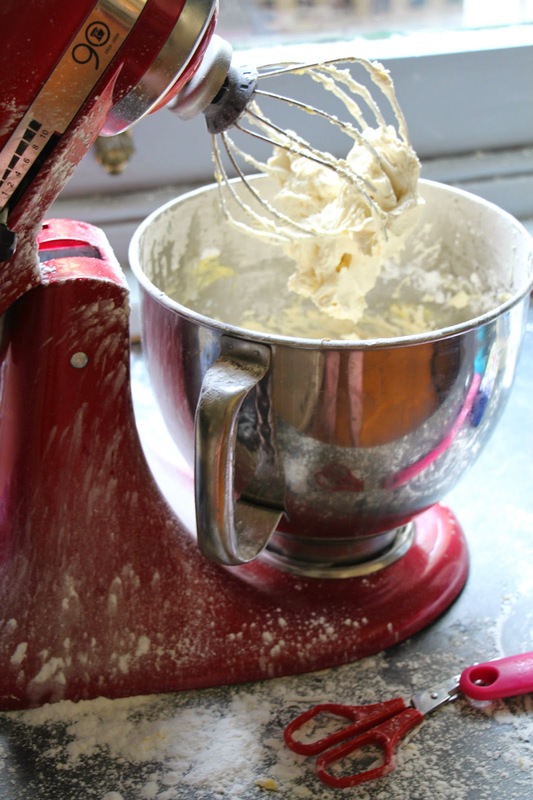 In a brain fade moment, whilst making a gorgeous White Chocolate and Cinnamon buttercream icing, I turned the mixer to high - just after adding the icing sugar to the butter. That icing sugar flew everywhere! The mess, oh, the mess! I won't be doing that again any time soon! Have you had a kitchen disaster recently? Do tell! If you have enjoyed peeking into my kitchen this month do click through to Celia's Fig Jam and Lime Cordial blog where you can peek into her kitchen and the kitchens of bloggers from around the world. Maureen, I'd love to bake a cake for your birthday!!! And I understand your pain with that glass! I even had to wash the kitchen window! Hi Liz! The Laveder tea is one that's meant to help sleep - I have a small cup about 30 minutes before bed, and I think it helps! Thanks for your advice about the Heilala vanilla beans - while expensive they will be worth the investment I'm sure! That braise and the vegetables look sensational. Yes, it's lovely being ablt to cook outdoors again. Thanks, Maree! Both dishes are simplicity itself! I do love this warmer weather and the abundance of beautfiul veggies we can enjoy! The chick pea braise looks fantastic. I absolutely adore chick peas! The tea also looks wonderful. I'm sure you were busy cleaning up the buttercream mess, hopefully you have had time to rest by now! We also have several birthdays this time of year keeping us busy, your cake is beautiful. Hi Gretchen! Thank you so much for taking the time to comment on my post! That icing sugar cloud went everywhere I can assure you! I'm currently pondering what cake I should bake for hubby's birthday next week! Good luck with your baking! well a friend broke our coffee plunger the other day! i heard a huge smash and there it was-in many bits. oh well now i can buy a super groovy one. funny how a small amount of anything turns out to be a huge amount when you have to clean it up:) somehow it morphs from a spoonful to a jugful don't you think? must be the kitchen gremlins! Sherry, you've nailed it! Those kitchen gremlins have a lot to answer for! Do post a picture of your new coffee plunger - I'd love to see it! Cheers! Celia, pears would have to one of my favourite fruits. I dream of having a garden big enough to accomodate one or two pear trees! As for those disasters - one day I'll share the story of the saucepan of toffee I spilled over the floor! That took days to clean up! Yes this year truly has gone by so quickly! We are also loving this warmer weather for cooking outside too! The cake you made looks delicious. Love T2 - haven't tried that flavour yet though, always so many to try!!!! Hi Sandy, thanks for your very kind comments! The lavendar tea is delicious! They gave me a sample of their Marrakech tea and a Chunky Chocolate brew to try! Will let you know how they went in another post! Cheers!